UC Davis entomology professor Diane Ullman is off to France in November but it's not a dream vacation. It's a dream opportunity: a Fulbright-funded scholarship to research plant virus-insect interactions. She will be studying plant viruses and the insects that transmit them. Her sabbatical will take her to Montpellier, France, to work with renowned vector biologists Stéphane Blanc and Marilyne Uzest at the National Institute of Agronomic Research (INRA) on the Campus International de Baillarguet near Montpellier. The Biologie et Génetique des Interactions Plante-Parasite (UMR-BGPI, CIRAD-INRA-SupAgro) focuses on plant pathogens and their interactions with arthropod vector in agroecosystems. She will be studying plant viruses in the genus Orthotospovirus (family Tospoviridae). This family holds the only plant infecting members in the order Bunyaviriales. The other viruses in this order infect animals and humans and are transmitted primarily by mosquitoes and ticks. The UC Davis professor has researched insect-transmitted plant pathogens for 37 years, targeting numerous insect vector species--from thrips, whiteflies, and leafhoppers to mealybugs--and the plant pathogens they transmit, including viruses, phytoplasma and bacteria. Ullman, former chair of the Department of Entomology and Nematology and a former associate dean with the UC Davis College of Agricultural and Environmental Sciences, expects the project will build strong research relationships between UC Davis and Montpellier that will lead to grant applications for international research and scholarly exchange opportunities for scientists, students and post-doctoral scholars. UC Davis professor Diane Ullman has received a Fulbright to France to study plant-insect interactions. 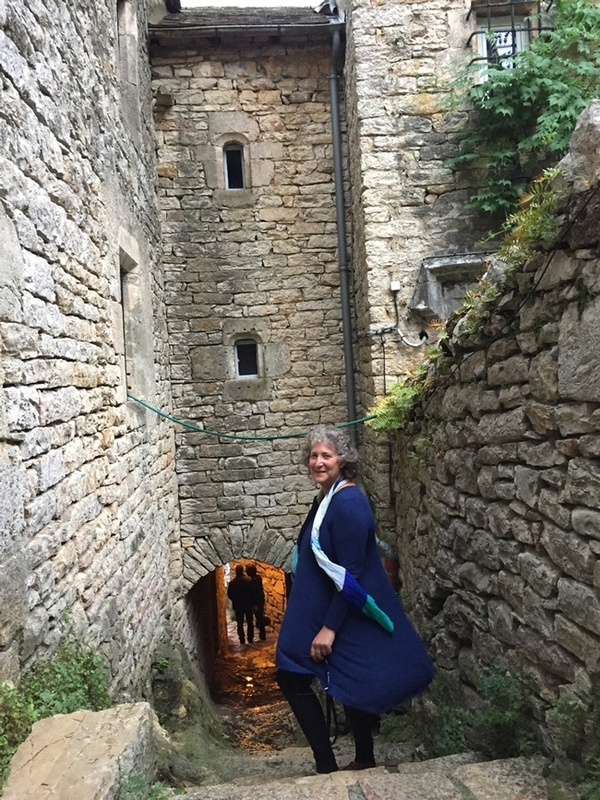 This image is of her in Saint-Enimie, which is in the Lozère department in southern France ("Departments" in France are comparable to "counties" in the United States.) This site is a few hours north of Langedoc, where she will be working. 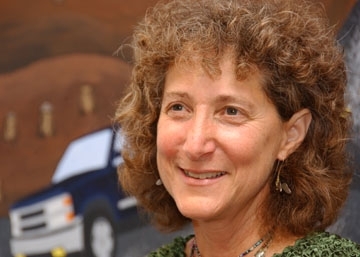 Professor Diane Ullman of the UC Davis Department of Entomology and Nematology will speak on “Winds of Change: Bridging Art and Science” at a seminar hosted by the UC Davis Wildlife, Fish and Conservation Biology on Wednesday, April 25 in Meyer Hall. The seminar will take place from 3:45 to 5 p.m. in the Foster Room, Room 1138. 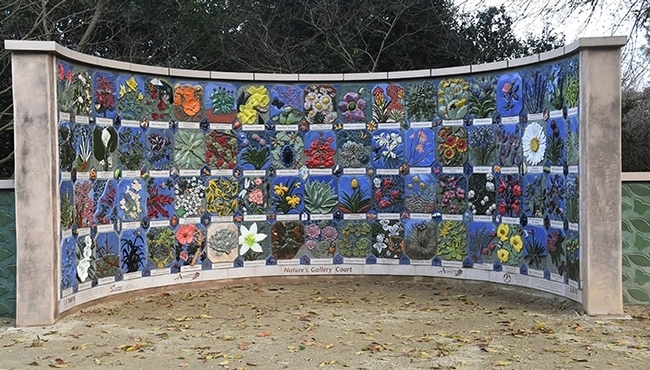 Ullman and Billick created the art/science fusion concept in 1997 with an undergraduate course, “Art, Science and the World of Insects,” that became the centerpiece and inspiration for the UC Davis Art/Science Fusion Program. Ullman, both a noted entomologist and artist, will relate how the program was developed, why the connections between art and science can be transformational to teaching in both formal and informal settings, and how community inspirations and educational infrastructure are needed to succeed. “As the winds of change moved across the landscape, bridges between visual and performing arts, design, science and technology were built and programs around this concept have arisen worldwide,” Ullman noted. A fellow of the American Association for the Advancement of Science and the Entomological Society of America, Ullman received the 2014 Excellence in Teaching Award from the Entomological Society of America and the UC Davis Chancellor's Achievement Award for Diversity and Community in 2007. 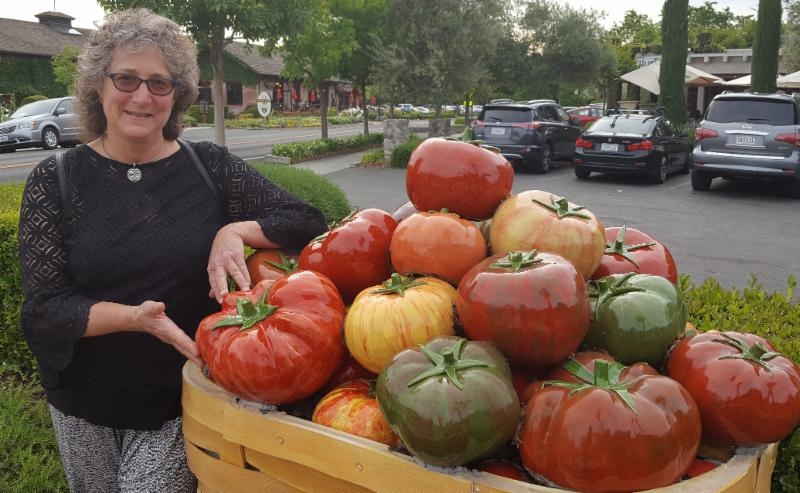 Artist-entomologist Diane Ullman with a tomato sculpture. A reception heralding the biannual juried show, the Consilience of Art and Science, an exhibit fusing art with science, will be celebrated from 6 to 9 p.m. Friday, Feb. 9 in the Pence Gallery, 212 D St., Davis. The reception is free and open to the public. Coordinators of the exhibit are Natalie Nelson, director and curator of the Pence Gallery; and UC Davis professor of entomology and artist Diane Ullman, co-founder and co-director of the UC Davis Art Science/Fusion Program. The work of 17 artists from a field of 85 worldwide artists are featured in the exhibit, which opened Jan. 26 and continues through March 2. The jurors--Jiayi Young, UC Davis assistant professor of design and Helen Donis-Keller, professor of biology and art at Olin College of Engineering, Mass.—will present the awards at the Feb. 9th reception at 8 p.m. The exhibit includes installations, video, 2D and 3D work by contemporary artists in the United States and abroad who are exploring themes in both fields of art and science. Selected artists, who range from Davis to Spain, are Omar Armendariz, Kenna Doeringer, Tamren Dong, Annette Goodfriend, Belinda Hanson, Joe Hedges, Allison Leigh Holt, Rickie Jacobs, Stephen Kaltenbach, Pantea Karimi, Alexandra Knie, Robert Krawczyk, Chris Santa Maria, Gail Morrison, Jennifer E. Padilla, Melinda K. P. Stees, and Daniel Tran. The goals of the exhibition, as announced last December, are three-fold: to show creative work that explores the intersection between art and science; to foster communication between the arts and sciences, and to spark new ways of viewing the world and ourselves, the organizers said. Art juror Jiayi Young holds a master's degree in fine arts (multimedia and painting) from Washington State University, Pullman, Wash.; a master of science in atomic physics from Kansas State University, Manhattan; and a bachelor's degree in fine arts and physics, Lawrence University, Appleton, Wisc. She works in the field of digital media with an emphasis on the cross-disciplinary areas of design, integrating art and science with cutting edge technology. Young focuses her current creative work on constructing data-driven interfaces, installations, real-time projection graphics, and performances in public and cultural places. Donis-Keller, who integrates the fields of art and biology, holds a master of fine arts in Studio Art from the Museum of Fine Arts in Boston and Tufts University, and a doctorate in biochemistry and molecular biology from Harvard University. She says an appreciation for the natural world from the molecular level to the biosphere drives her art. The exhibit is open from 11:30 a.m. to 5 p.m., Tuesday through Sunday through March 2. Further information on the show is available from Nelson at (530) 758-3370 or penceartdirector@sbcglobal.net. Speakers at the Nov. 16 LASER Event at UC Davis are (from left) Beth Ferguson, UC Davis Department of Design; Petr Janata, Department of Psychology Center for Mind and Brain; and Michael Arcega of the San Francisco State University Department of Art. Faculty presentations on solar design, psychology of music, and language and sociopolitical dynamics will highlight the Leonardo Art, Science, Evening Rendezvous (LASER) event, set from 6 to 8 p.m., Thursday, Nov. 16 in Room 115 of the UC Davis Music Building. The event, free and open to the public, begins with networking at 6; and speaker presentations at 6:30. At 7:15, the program includes conversations and rapid fire community sharing. The speakers are Beth Ferguson, UC Davis assistant professor of design, who will discuss "The Electric Driver Solar Kiosk"; Petr Janata, professor, UC Davis Department of Psychology and Center for Mind and Brain, who will cover "Musical Neurobiographies"; and Michael Arcega, assistant professor, San Francisco State University Department of Art, whose topic is "WORDSWORDS." Ferguson operates Sol Design Lab, a solar furniture design/build company. She will discuss her project, the Electric Drive Solar Kiosk, an innovative combination of solar technology and public art that provides shaded seating, LED lighting and free solar power for the public in downtown Austin, Texas. Ferguson collaborates with public utilities, festivals, and universities to position solar energy as a civic and public resource, engaging thousands of participants in the development of projects such as solar charging stations, up-cycled public furniture, climate change emoji, and Green Maps. She has received commissions from SXSW, Austin Energy, ZERO1 San Jose Biennial, TEDxPresidio, Coachella, The ZERO1 American Arts Incubator, the U.S Department of the State's Bureau of Educational and Cultural Affairs, and the Bay Area Maker Faire. Janata, in his research on how the human brain engages with music, has examined expectation, imagery, sensorimotor coupling, memory, and emotion in relation to tonality, rhythm, and timbre. His work also emphasizes the use of models of musical structure to analyze behavioral and brain data. "I am particularly interested in musical situations that elicit strong emotional experiences, such as music-evoked remembering or being in the groove," he says. Janata, who holds a doctorate from the University of Oregon, received a Fulbright Fellowship in 2010 to do research in Prague, and in the same year, he received a Guggenheim Fellowship to further his investigations of what music-evoked autobiographical memories can tell us about the functional organization of the human brain. 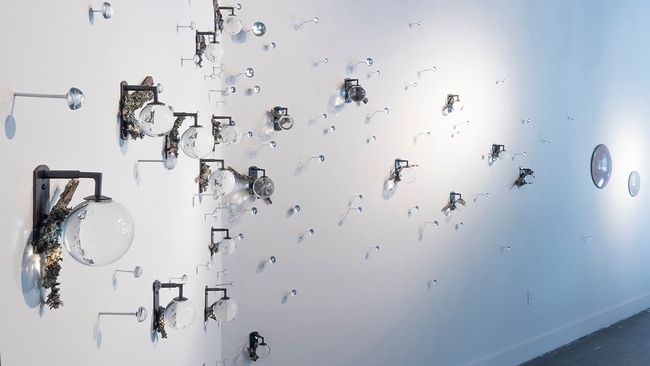 Arcega is an interdisciplinary artist working primarily in sculpture and installation. His research-based work revolves around language and sociopolitical dynamics. His subject matter, embedded with historic narratives, material significance, and geography, deals with circumstances where power relations are unbalanced. A naturalized American, he says he "investigates cultural markers that are embedded in objects, food, architecture, visual lexicons, and vernacular languages." His work has been exhibited at the Asian Art Museum, Museum of Contemporary Art in San Diego, the de Young Museum in San Francisco, Yerba Buena Center for the Arts, the Orange County Museum of Art, The Contemporary Museum in Honolulu, the Museum of Fine Arts in Houston, Cue Arts Foundation, and the Asia Society in New York, among others. 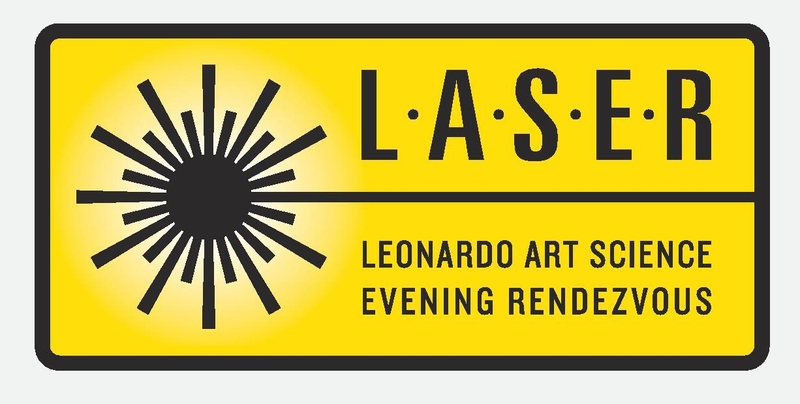 LASER is sponsored by the Humanities, Art and Cultural Studies, College of Letters and Sciences; the UC Davis College of Agricultural and Environmental Sciences and LASER/ISAST (The International Society for the Arts, Sciences and Technology). Entomologist/artist Diane Ullman, UC Davis professor of entomology, is a co-founder and co-director of the UC Davis Art/Science Fusion Program, which spearheaded the formation of LASER events at UC Davis. 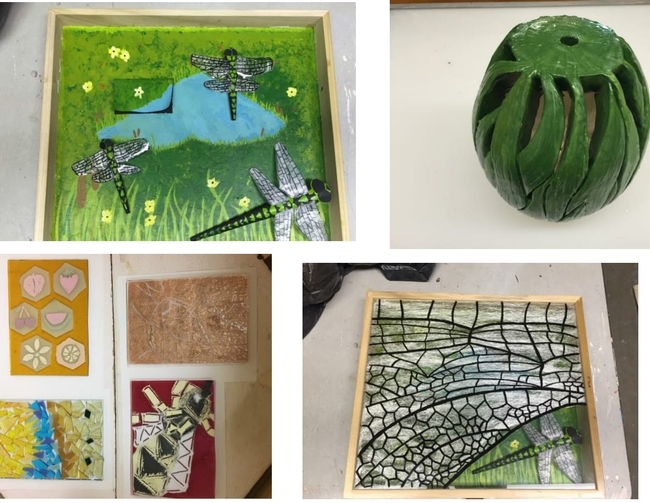 Diane Ullman's Entomology 1 class has scheduled a Student Art Showcase of ceramics, glass and paintings at a public reception from 6 to 8 p.m., Thursday, June 8 in the UC Davis Environmental Horticulture Courtyard. The event, celebrating the work of the students, is free and open to the public. Diane Ullman is a professor of entomology, an artist, and the co-founder and co-director of UC Davis Art/Science Fusion Program. She is the former associate dean for undergraduate academic programs, College of Agricultural and Environmental Sciences. Ullman received the Entomological Society of America's Distinguished Teaching Award in 2014.